A damp overcast morning failed to deter thousands of people gathered at Stonehenge in England to celebrate the summer solstice. 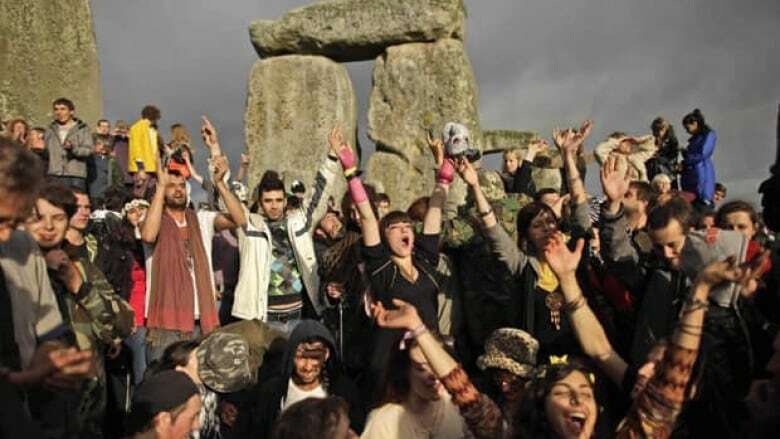 Around 18,000 neo-pagans, new agers and curious visitors gathered Tuesday in heavy rain to watch the sun rise over the ancient stone circle on the Salisbury Plain about 130 kilometres southwest of London. The celebrations are a modern twist on solstice celebrations that were a highlight of the pre-Christian calendar. Police said the event was good-natured but 20 people were arrested for drug and public disorder offences. Stonehenge was built in three phases between 3000 BC and 1600 BC. It is one of Britain's most popular tourist attractions with over 850,000 visitors a year.